Ruth Wood (Jane Wyman) is living in New York City in 1942, in the midst of a World War. Ruth works at a shoe manufacturer with her friend Grace Ullman (Eileen Heckart) and a young blonde named Millie Kranz (Peggie Castle). Millie’s having an affair with the boss, Mr. Jalonick (Fred Clark). By night, Ruth cares for her mother Agnes (Josephine Hutchinson), who is ill and never leaves the house. One night, on her way home from work, Ruth and other commuters are forced to take shelter in an office building due to a sudden rain storm. 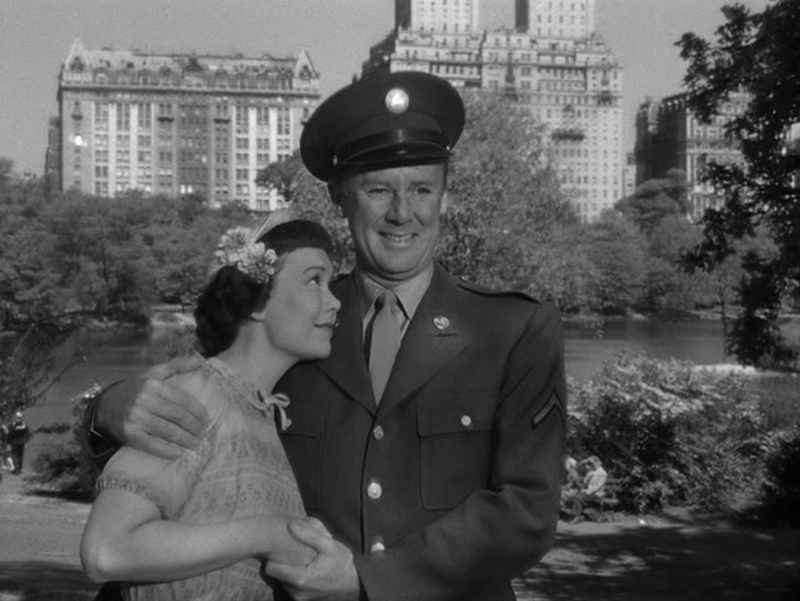 Here Ruth meets Arthur Hugenon (Van Johnson), a pleasant G.I. who strikes up a conversation with her despite her shyness. Arthur invites Ruth to dinner but she turns him down, saying that Agnes is expecting her home. Much to Ruth’s surprise, this doesn’t deter Arthur at all. He decides to buy food to-go for three at a nearby deli and goes home with Ruth to have dinner with both her and her mother. Ruth takes a liking to Arthur as they share a meal and she listens to his stories of growing up as a Tennessee farm boy. Anges isn’t so sure about the suitor, but he continues to spend time with both of them and win them over… until fate may intervene to ruin the blossoming love between Arthur and Ruth. 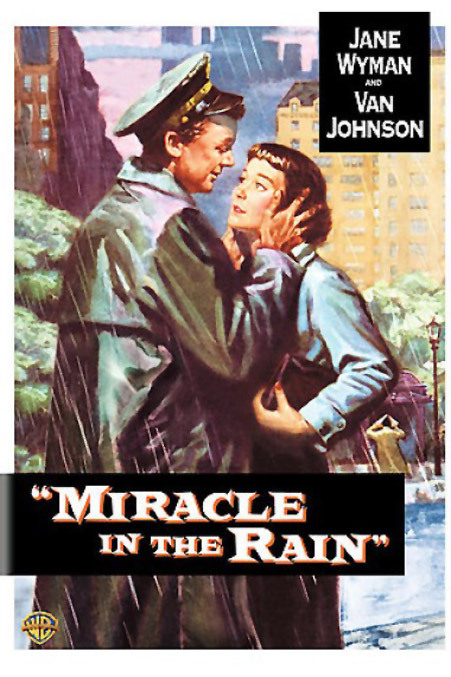 Rudolph Maté directs Miracle in the Rain, a tear-jerking 1956 romantic drama. The film was written by Ben Hecht, based on his own novella. Miracle in the Rain is a wonderful drama. The story can move along slowly at times, but it has interesting characters and is full of emotion. The plot “twists” are all quite expected since this is a standard wartime romantic drama, but the predictability does nothing to hamper the film’s impact on the viewer. 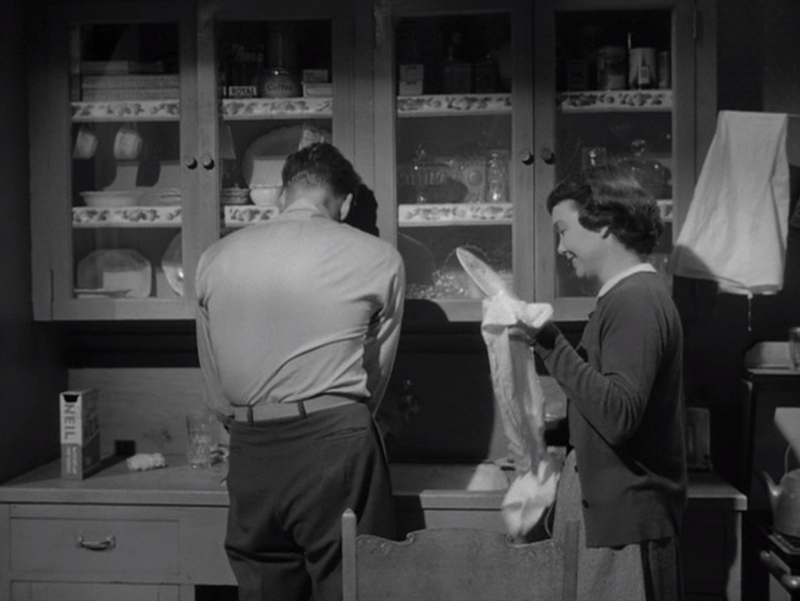 I also appreciate the fact that, though released in the mid-1950s, the film feels very much like a 1940s drama. It is set during World War II, and it fits in well with wartime romances like The Clock and Waterloo Bridge. 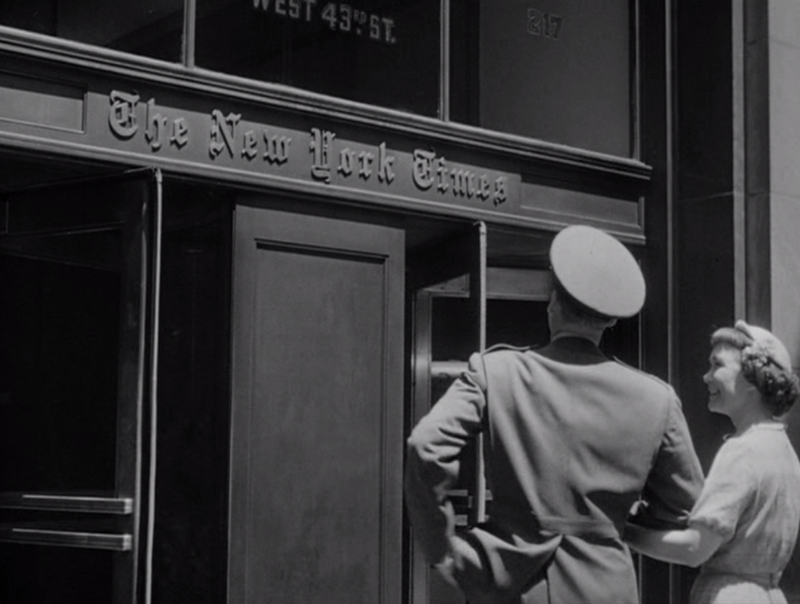 Like The Clock, this film makes fantastic use of New York City scenery, including Central Park, the New York Times building and St. Patrick’s Cathedral. Alongside the romantic drama, there’s a great subplot involving Ruth’s absentee father, Harry, and the weaving of medical tragedy and religious faith into Ruth’s storyline. This adds even more layers to the film that allow the viewer to get attached to the characters and story. 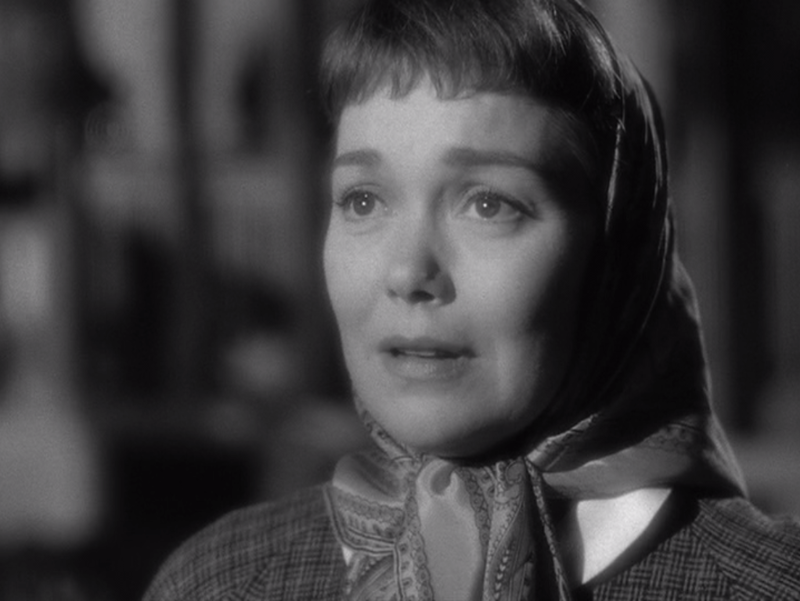 Jane Wyman does a fantastic job of carrying the film. She and Van Johnson make a very good pair. There’s something inherently likable about each of them as actors, and they have a sweet chemistry that works well for the film. Wyman must carry most of the film on her own, though, and she proves herself more than capable even when the script can get slightly over-dramatic. I recently acquired this DVD from the Warner Brothers online shop along with a couple of Bette Davis films (which will be reviewed for the “Favorite Things About…” series eventually). The picture and sound quality are stellar, as I’ve come to expect from the WB Shop. The DVD has a couple of very nice special features as well — two “behind the scenes” shorts, originally aired as a part of the TV series Warner Bros. Presents. These shorts are lots of fun, featuring interviews with the actors, who are totally cheesin’ it up for the camera. They make a nice brain-cleanser after the weepy feature. The first of the features deals with the production of the film on location in NYC, detailing how cameras had to be hidden so the actors wouldn’t attract the attention of autograph-hunters. Some of New York’s streets were also reconstructed on a backlot, for scenes that required “equipment too large to be hidden.” In the second feature, the segment host heads to the film lab, where the day’s footage from Miracle in the Rain is being processed. DVD score: 4.5/5 – Could have more features, but great quality, and the two included short segments are wonderful! I was thinking before you mentioned it that the film story sounded a little like ‘The Clock’, a movie I really liked. And I remember Peggie Castle from ’99 River Street’…did her subplot with her boss go anywhere in this film? Not really. We get to see a little bit of Ruth’s coworkers, but mostly just their reactions to her situation. I was kind of glad for that, though. There were a couple of different subplots going on in the beginning and I think the film would’ve been less effective if the focus hadn’t shifted completely to Ruth. (Her life’s got enough complications for five people, haha.) If I remember correctly Millie’s situation does get resolved, she just doesn’t get a whole lot of screen time. Strange that the filmmakers would even introduce it, but you’re right, it makes sense to concentrate on Ruth’s story. Thanks Lindsey! It did serve a purpose, to show Ruth’s lifestyle and how different she was from her co-workers in the beginning. She’s very introverted, cares for her mother, never accepts invitations to go out, side-eyes Millie for getting with the boss, haha.